1996 is an interesting year for WWF. The Bret Hart era was starting to wind down, and the Diesel era has thankfully come to an end. 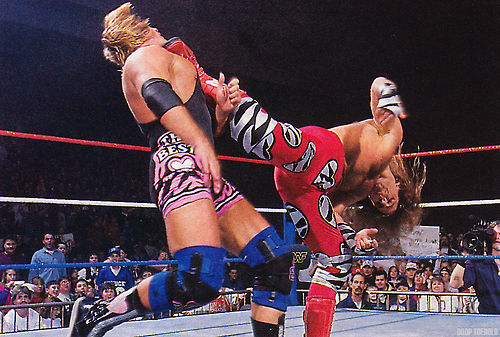 With these things all coming to an end, it was the beginning of what we can call the Era of HBK, for better or worse. February 1996, Louisville, Kentucky. 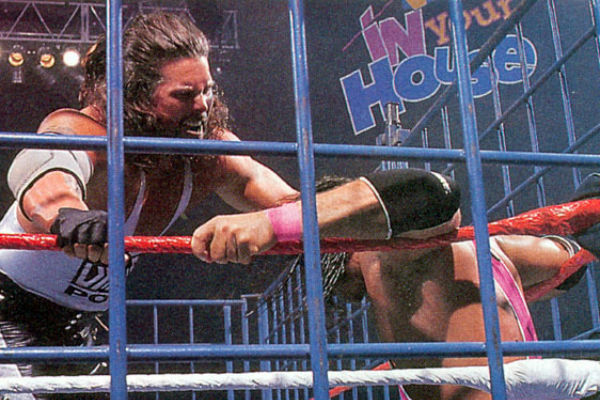 The 6th edition of the In Your House PPV arrived with a dark match before it went live of Jake The Snake Roberts vs Tatanka, which Jake won. We also got three dark matches after the actual PPV, which is odd in essence. Fans usually would leave after the PPV is done, but if you stayed afterwards, you got to see Goldust take on The Undertaker, which makes you wonder why they didn't televise it. Regardless, today we look back at the PPV, the matches and the overall quality of it. It is time for yet another EOTR Retro Review, a new but very big series here on EOTR. Let's get into it. -This match is weird. 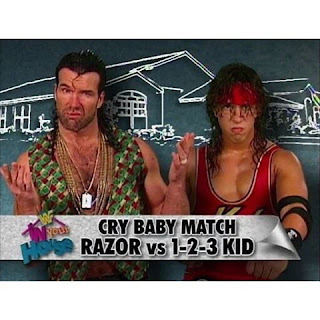 After the 1-2-3 Kid turned on Razor, we witnessed this match, which was a bit strange in essence when you think about it. 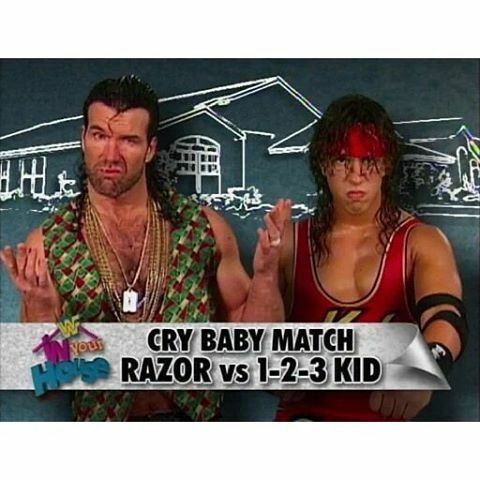 Crybaby match? Meaning the loser wore powder and a diaper when the match ended along with drinking a bottle (insert alcoholic Scott Hall joke here). It was really weird and the concept doesn't make any sense to me, but the match was enjoyable at least. Razor wins, but I rather wash this from my entire existence and memory. It was such a weird and strange match and concept. I can't shake this at all. -They really let Hunter struggle in the early days. As crazy as this sounds, Hunter Hearst Helmsey was just a simple blueblood who apparently was accompanied by a new rich lady to the ring every week. It was odd to say the least, and the gimmick reeks of cheesy New Generation Era as is. Duke Droese was positioned to be your everyday man..... who happens to also be your local dumpster man. Yes, a trash man was an actual gimmick. Droese loses this one, and the pointless rise of Hunter continues. Though it was a very slow build to make him viable as a performer. -To think, this match back in 1993 or 1994 would have been classic material, but a bigger and out of his prime Yoko struggled with Bulldog. I saw the angle for this one, and with Bulldog only being used as match fodder to build to what could only be seen as Vince McMahon's dream match of Yokozuna vs Vader, as Yoko got the DQ win over Bulldog, but the arrival of Vader after the match ended signaled where they wanted to go. Once again, Vader vs Yokozuna in 1992-1993 when both were in their prime could have been the greatest big man match ever. However, this was a few years too late. Yoko vs Bulldog was decent, but only used to build up another feud. -The match of the night. Hands down. And who would expect any less? Shawn and Owen always had good chemistry and this was certainly one of their better matches, and they made sure to add different elements of comedy, suspense, and storytelling. They teased the idea of Shawn possibly still suffering from the effects of the kick Owen "concussed" him with months prior, and that played excellently into the story of the match. This was to see who would go to Wrestlemania 12 and challenge the winner of the main event for the WWF Title and as history showed, of course Shawn won. This was a near classic and a great match, easily the best thing on this card, and the only great match here. -I always thought Nash and Bret didn't really have much chemistry, yet their matches were never that bad. Their matches still lacked something about them and I can't pinpoint what that may be exactly, but this match didn't do it for me like their near classic at Survivor Series 1995 did. Bret and Diesel had a nice battle as Diesel was in the process of turning heel after the attempt to force him didn't work (*cough* Roman Reigns *cough*). The Undertaker appeared to mess with Diesel and cause him to lose the match, which was totally fine to me though it did no favors to Bret. Bret vs Shawn was set and Undertaker vs Diesel was set for Mania and essentially this PPV was used strictly for that. I'm okay with that, I just wish the In Your House PPVs had more to them than this. The PPVs lacked the big fight feel minus the main events, and being that they only televised 5 of the 9 taped matches, PPV buyers were screwed over in a way. Regardless, In Your House 6 is a rather interesting PPV, for better or worse.